Visit Garden Beet for tons of great gift ideas for your garden. Salad and Herb Vertical Planter – the Vertiplant – is a wall hung planter that you could use for vegggies or flowers. Or both! Chicken Sculpture – very pretty! If you think it’s too pretty for the garden then find room for it in the house! – stunning piece of art work that would look good in your garden! – recycled plant pots that are so pretty! – every garden needs a sundial! – very unusual and pretty! A real twist on a garden Gnome. – breath takingly sweet idea! I really love these! WANT THEM! The most unusual planter ever! Pretty! They collect water, reflect and contrast with the changing seasons. Ever changing art! Big Hug Solo – water and dirt resistant bean bags for outside! Living Art Frame – justv mount the frame to the wall and either insert a small pot plant or a vase with cut flowers. Free UK mainland delivery on orders over £50. Worldwide delivery also available. Garden Beet offers you Free UK mainland delivery on orders over £50. Worldwide delivery also available. garden accessories at Garden Beet. 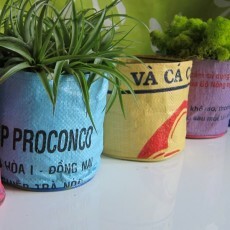 these include these very funky recycled planters! These rice bag planters allow the water to drain out so your plants never sit with wet roots. This encourages them to grow healthy roots because they can get air to them! They last between 1 and 4 seasons – according to the exposure to sun and rain. You could also use them in the house on your desk for pens!